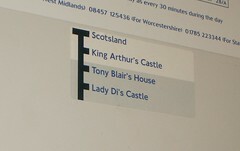 I was coming home on the train last night, too tired to even read, and was just staring into space when I noticed this strange sign just below the bus connections map on the wall of the carriage. I just had to get up and take a picture (trying not to look too conspicuous). It's obviously a joke, but I'm wondering if it's one of the spoof signs put up by Dave Askwith and Alex Normanton, and featured on the BBC's website. Wherever it came from, it really cheered me up!